UPDATE: we are heading to Cuba on January 10th for a month of exploration in support of the Cuban people. Be sure to join the culinary and cultural journey around the world so you don’t miss a thing, it’s free, You can also follow me on Instagram, Facebook , Pinterest and youtube to follow along our journey. I thought a repost of Cuba was in order, enjoy and watch for new exciting recipes to follow! Cuba gets her name from the Taino people, an abbreviation of the word Cubanacán, which means “where fertile land is.” She is a long and narrow island nation, affectionately called El Caiman or El Cocodrilo, as the aerial view resembles an alligator or crocodile. The republic of Cuba is made up of the Island of Cuba, the Isle of Youth and more than 400 small islands and cays. Cuba is located about 90 miles south of the Florida Keys and 125 miles east of Cancun and Jamaica. The Cayman Islands lie to the south and Haiti to the east. Cuba is the largest and most populated Caribbean island. “Juana” is the name given the Island by Christopher Columbus in 1492, in honor of Queen Isabella’s son, but that name never stuck. The Taino people came to the island from Venezuela about one thousand years ago. The original inhabitants were Native America tribes, the Ciboney and Guanahatebey. In 1511 Spanish forces took over the islands and declared them a Spanish Territory. The Taino people were forced into slave labor and most died from overwork and diseases brought by the Europeans. The Spanish then brought hundreds of thousands of slaves from West Africa to plant and harvest sugarcane and tobacco. (Cuban cigars are still world renown.) The population today is mostly mulatto (a mix of European and African descent) the balance is 37 percent white, 11 percent Black and one percent Chinese. The official language is Spanish and the dialect is similar to other Hispanic Caribbean Islands but the highly expressive use of hand gestures are distinctly Cuban. Cuba was under the control of Spain until 1898 when the treaty of Paris was signed. The United States claimed ownership of the remaining Spanish Colonies: Cuba, Puerto Rico and the Philippines. By 1902, the Cubans were not happy with another colonial power taking control and after many protests, the United States agreed to withdraw militarily from Cuba. One of the conditions included a 99 year lease to a naval base at Guantanamo Bay. The lease was extended into perpetuity in 1934. After several dictators and coup attempts, Fidel Castro’s Revolution toppled the previous dictator on January 8, 1959, who fled the country. Castro spoke to the masses and claimed true independence for Cuba, the first time since 1511. Cuba became a communist state, which caused some of the elite to flee. Having a communist country so close to United States (U.S.) shores became a major issue. This led to the failed Bay of Pigs and then the Cuban missile crisis, which then turned into a 50 year long embargo. (Rumor has it, U.S. President Kennedy purchased 1200 Cuban cigars before the trade embargo was enforced). Cuba was trading with the Soviet Union and Venezuela as its major trading partners. In 1989 when the cold war ended and the Soviet Union broke up, Cuba entered a very difficult period known as the “Special Period.” The country lost 80 percent of its imports and exports. They lost their oil connection, which caused severe hardship in the ability to operate transportation, industrial and agricultural systems. This period was especially hard on the Cuban people. They were hungry and had to drastically change their way of life. One good thing that came out of the “Special Period”, was organic agriculture. Cuban producers turned the declining availability of pesticides and fertilizers into an opportunity to shift toward organic production, which ended up having numerous environmental, social and economic gains. The government allowed 80 percent of their farmland to be turned over to workers. Once they met the government quotas for their crop, they were allowed to sell the excess to the local farmers’ market. Havanans transformed their vacant lots, backyards and even roof tops into small farms and grazing areas for animals. This change had huge positive impacts on the peoples’ livelihood as well as on their health, as chemicals and pesticides used in farming are often linked to increased cancer risks. Like many communist countries, Cuba is officially atheist. However, many Cubans are Catholics and in 1997 the government allowed Christmas to become an official holiday, in preparation for Pope John Paul II’s visit. Cuba holds one of the highest literacy rates in all of Latin America and they have the highest doctor to patient ratio in the world. Cuba is known for sending doctors abroad when the need arises. A couple of perks to a communist society is free healthcare and education. Baseball is the national sport of Cuba and loved there! They have special squares set up just so credentialed citizens can discuss baseball and discuss they do. They are so proud of their national team. One problem that Cuba faces is defection by their best players. They are typically paid around $2000 annually there compared to six figures and more in the U.S. Even Castro admits, that makes it hard for Cuba to compete. By the way, Fidel Castro led the country since the revolution in the late 1950s until 2008, when he passed the baton to his younger brother Raul, due to illness. The country of Cuba has two currencies, the Cuban peso and the Cuban convertible peso (CUC). The Cuban peso (CUP) is known as the national currency. This is what the population uses for necessities. Luxury Items and most tourist destinations use the CUC. One CUC buys about 25 CUPs which often confuses tourists, by seeing government controlled item prices that they perceive as too cheap. There is a system set up in Cuba where tourists can stay in what are called casas particulares (private houses licensed to offer lodging to foreigners.) All the restaurants had been government owned and run by employees until the economic crisis of the Special Period. Now, in Cuba the best food will be found in your casa paladares (locally owned restaurants in private homes and made legal in the 1990s.) Seating is limited and there are many restrictions for the homeowner regarding staff and such, however this is where you will savor the delicious, homemade Cuban cuisine. Eating or staying in state owned hotels and restaurants is significantly more expensive. Visitors can choose casas particulares and paldares as alternatives and a great way to benefit the people and get a true cultural experience. Just make sure they have the proper licensing, as Cubans are forbidden to host a foreigner without a license and the punishment is severe for both parties, if caught. 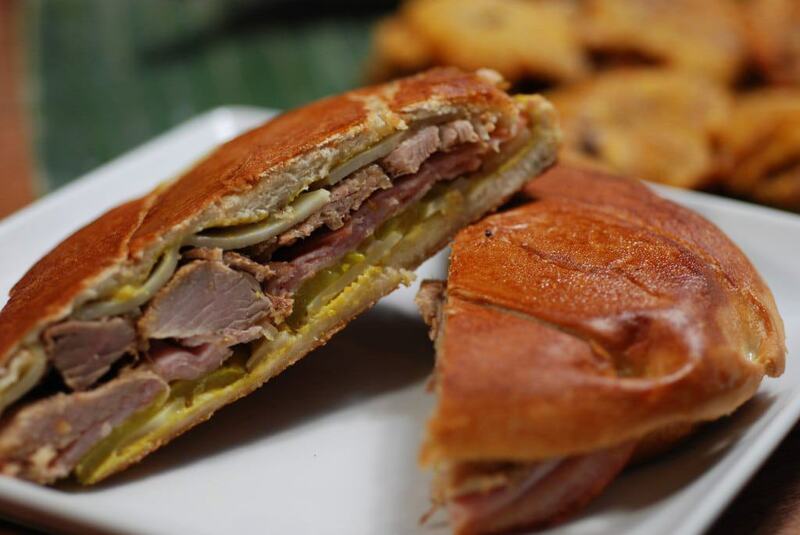 The Cuisine of Cuba is a fusion of the Taino; the Spanish, West African and Caribbean. The tropical climate and fertile land produces fruits and root vegetables used in many Cuban dishes. Pork is the most commonly eaten meat. There are restrictions on seafood and beef, which are reserved mainly for the tourist industry. We began our meal with a Mojito, a popular lime and rum drink served with mint and a Cuban toast, “Salud.” The Mojito was known to be the author Ernest Hemingway’s favorite and he enjoyed them while writing two of his most famous books there: “The Old Man and the Sea” and “For Whom the Bell Tolls.” The rum maker, Bacardi, had its headquarters in Cuba until the Revolution when they moved it to Puerto Rico. Needless to say, rum is very popular in Cuba. 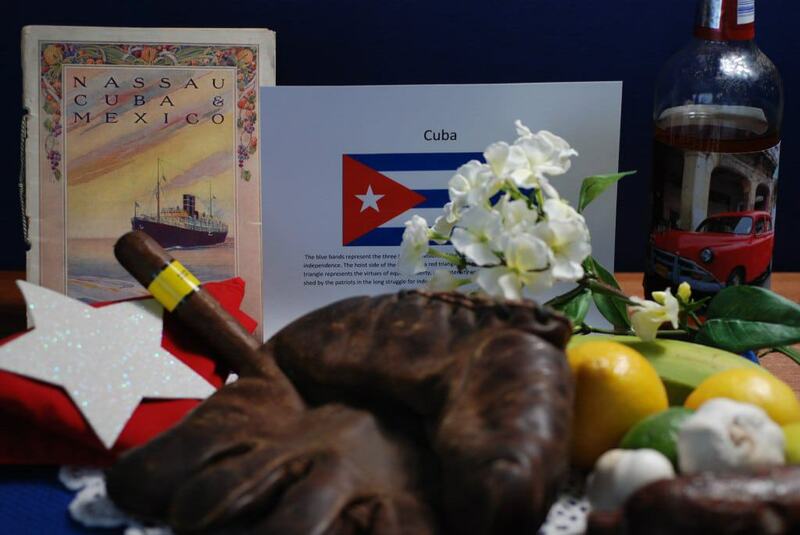 We decorated the table with colors of the Cuban flag; red, white and blue and with pictures of old American cars. Cubans are only allowed to own pre-1959 cars. It is an amazing site to see how they have maintained and restored these vintage treasures. If the day ever comes when the Cubans can sell them, I hope they won’t, as they add such charm and uniqueness to their country. 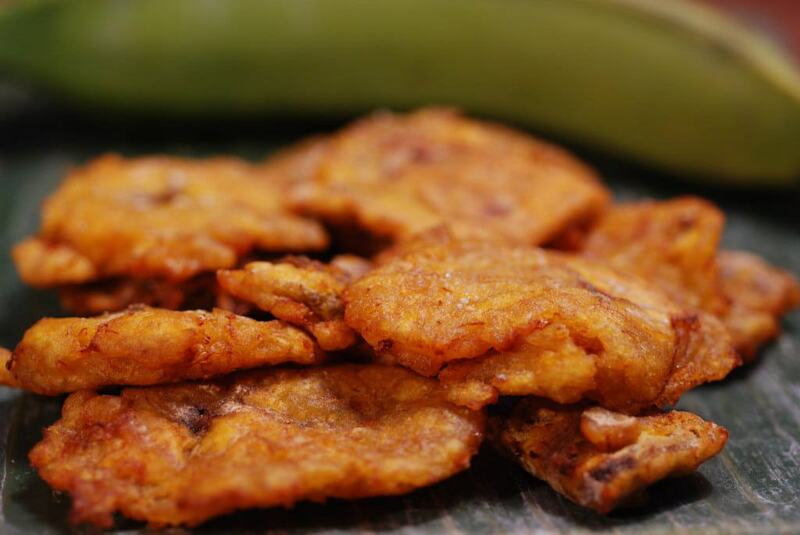 For our first course we enjoyed hot fried plantains, always a delicious treat and best eaten right out of the fryer, a popular snack in Cuba. Next we had the main course served family style. Lechon Asado was served with white rice and black beans in a sofrito base. Together it’s called Moros y Cristianos. 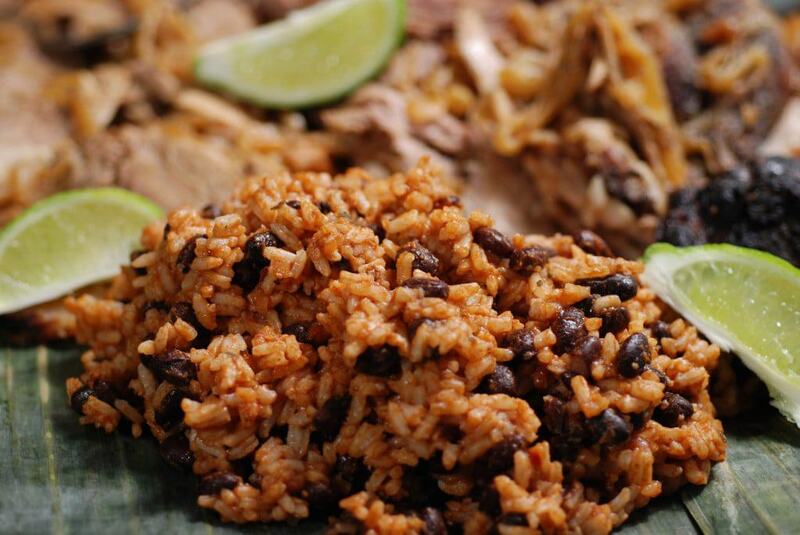 Honestly, I think it is the best combination of rice and beans I have ever had and I will include this recipe in my favorites. We added a simple but delicious organic Cuban salad. 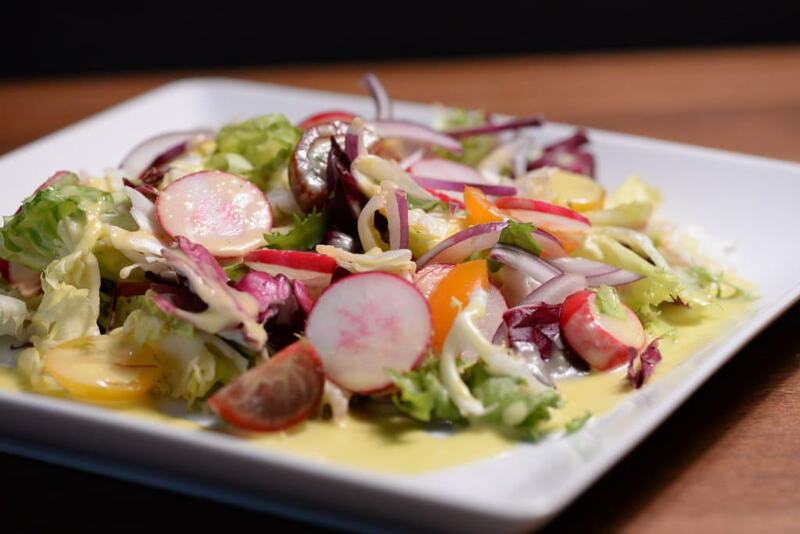 The salad, light and refreshing, with a citrus and garlic dressing, complemented the flavor of the pork. 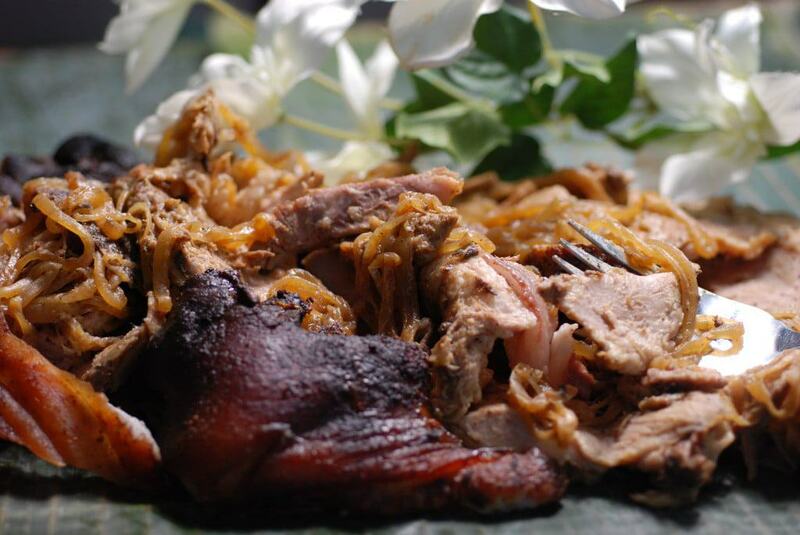 The main dish, Lechon Asado, is usually reserved for special occasions where the whole pig would be roasted in the ground, covered in banana leaves. They also sell hog roasting boxes that many Cubans own and have become a popular alternative to roasting the pig in the ground. What makes the pork so wonderful however, is the marinade called Mojo. 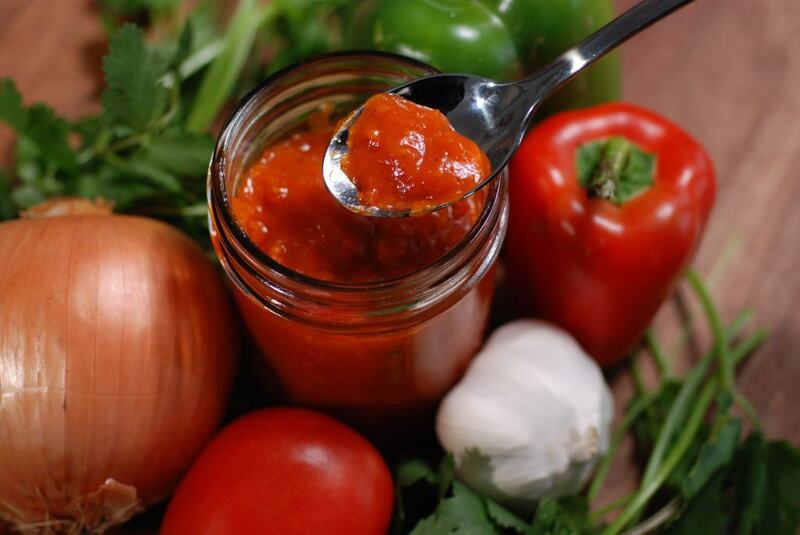 This is a blend of citrus and garlic that is unforgettable. I roasted a whole pork shoulder that I found with the skin on. It was superb! For dessert we had hot chocolate and churros. 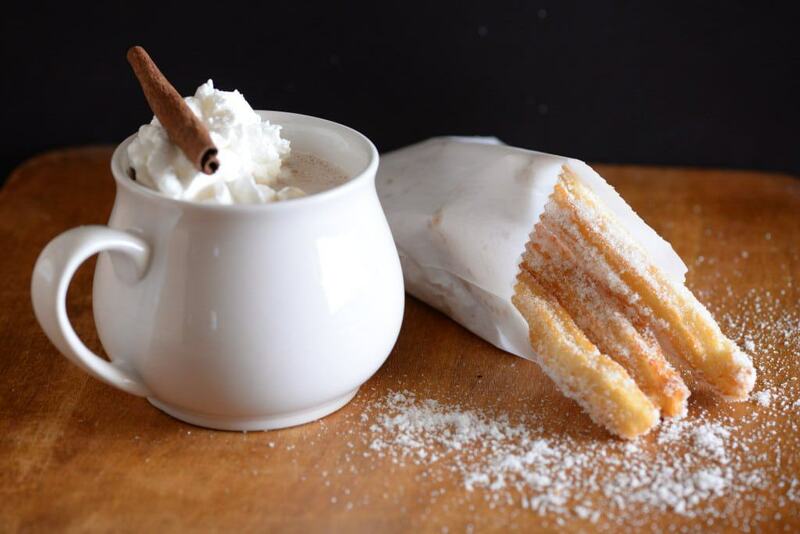 The churros are basically fried dough rolled in sugar and served with a nice big cup of hot chocolate to dunk them in. I know we shouldn’t but, YUM! As we leave this country Cuba, we do so with hope, as the U.S. Embargo has just been lifted. Recognizing that the decision to lift the embargo is controversial, as things in Cuba have not changed in decades, I see both sides of the argument. With that said, we can only hope that things get better for the Cuban people. Selfishly, I am hoping to get a chance to visit and stay with a Cuban family in a casa particular and dine with them on the incredible cuisine! P.s. What do with all those pork leftovers? A Cuban sandwich of course. Here’s a delicious bonus recipe!